DeVore is a name that's no stranger to Stereophile readers, two DeVore Fidelity models being listed in "Recommended Components," and designer John DeVore often mentioned in Stephen Mejias' blog. The Gibbon X ($11,000/pair) is a new three-way floorstanders, featuring all NewGen drivers, including a woofer that is 50% larger than the woofer of the original Gibbon and has double the linear voice-coil travel. The new midrange driver has a phase plug for improved transient performance, and has its own chamber. With the LP of Louis Armstrong and Duke Ellington playing on the system that included the Gibbon Xs (Well Tempered Lab turntable and arm, Audio Research electronics), I was sorry that I had to leave to continue on my rounds. 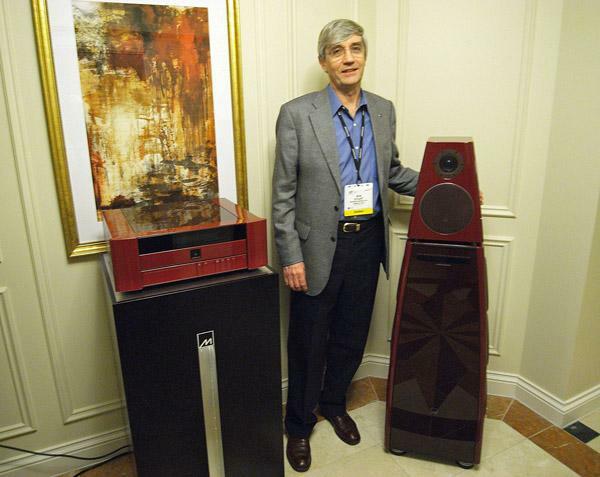 All-new from TAD at the 2012 CES was a more affordable line of components than the 600 series and electronics and Reference loudspeakers. 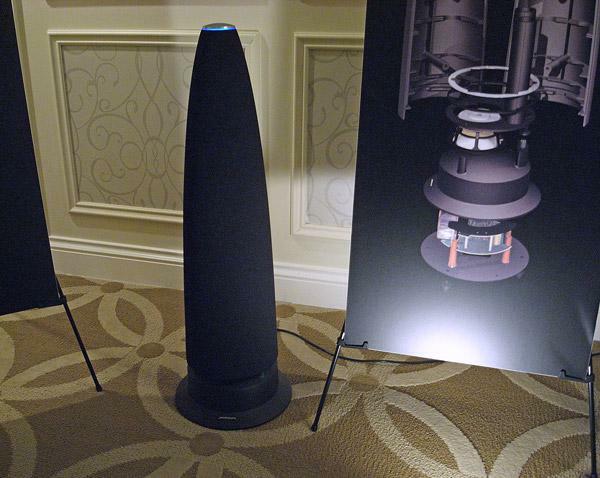 The Evolution Series E1 speaker ($29,800/pair, right) still uses a concentric tweeter and midrange unit, like its more expensive Reference One sibling (left), but while the tweeter dome is still beryllium, the midrange diaphragm is now magnesium rather than beryllium and the unit is built on a 5" rather than a 6" chassis. Twin 7" woofers are used, but still with the highly linear corrugated surrounds and with a 2.5: voice-coil. Bass extension is specified into the low 30s, anechoic. I auditioned so much music on this system, I thought I was outstaying my welcome, but the sound of the E1 system, at $76,800 including the new M2500 500Wpc power amplification and the C2000 D/A preamp driven by asynchronous USB from a MacBook Air and all sitting on a Finite Elemente rack was open, natural, and uncolored, with superb low-frequency definition and weight. I couldn't imagine how the sound of a a 176.4kHz/24-bit transfer of Rebecca Pidgeon singing "Spanish Harlem" could be bettereduntil TAD's Andrew Jones switched to the TAD Reference system (see next story). It costs $42,000 but TAD's new C600 solid-state line preamplifier features dual-mono construction, an all-discrete signal path, a separate power supply, and fastidious attention paid to detail in both its design and construction. The amber LED display for example, is DC-powered rather than from the usual multiplexed supply, to eliminate EMI interference. 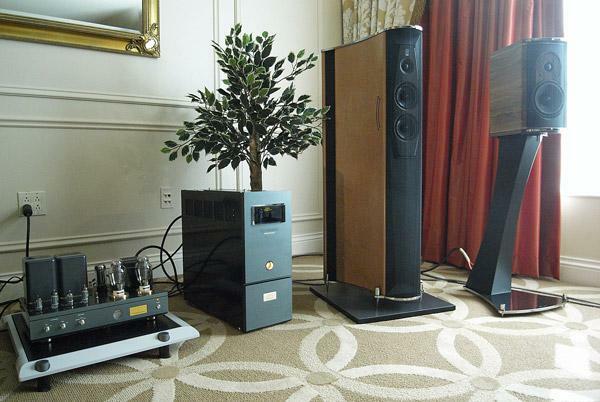 And the sound, in conjunction with the D600 SACD player, M600 monoblocks, Reference One floor-standing speakers, and HRS rack to give a system price of $214,500? I'll leave it to Stephen Mejias to describe in his show wrap. Personally, it was a highlight of the 2012 CES. 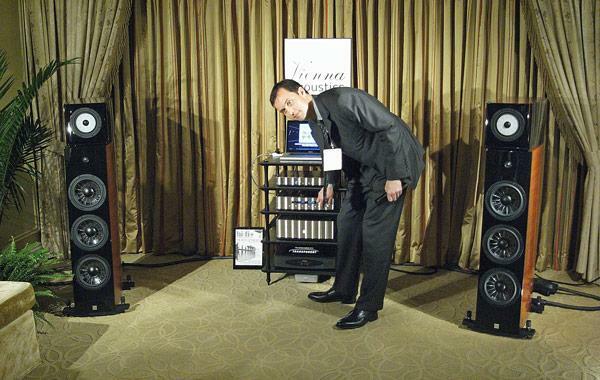 Vienna Acoustics were demming the latest version of Die Musik speaker, which we first saw and heard at the 2008 CES. VA's Patrick Butler played the role of DJ for me, operating the Jeff Rowland Design Group gear. 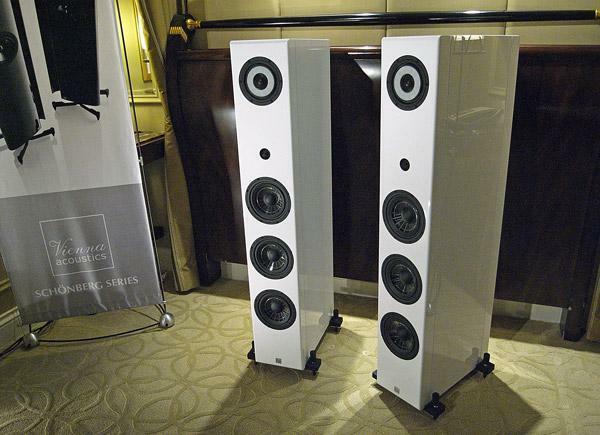 Scheduled for a summer 2012 launch with a projected priced of $9000$10,000/pair, the Vienna Acoustics Beethoven Imperial Grand speaker uses a smaller flat, concentric tweeter/midrange drive-unit developed from that used in the Austrian company's top models, The Kiss and The Music. But like them, it uses a supertweeter to cover the range above 17kHz. The cabinet is sourced from Italy and the speakers are assembled in Vienna. And the name? Well, the Bösendorfer company is also based in Vienna and their flagship piano is also called the Imperial Grand. Other than the soft ring of blue light at the top, Meridian's new M6 powered loudspeaker ($9000/pair) looks unprepossessing but hides a wealth of high technology within its black enclosure. The entire range from 200Hz to 25kHztwo decades!is handled by a single front-firing 3" driver at the top of the cabinet. This is a development of the drive-unit Meridian designed for the F80 music system and is coupled to a downward-firing woofer, which can be seen in the exploded diagram next to the speaker. The M6 has a digital input and the use of DSP for its crossover and equalization means it can be placed near room boundaries, maximizing its Spouse-Acceptance Factor. I listened to the Sheffield Drum Record from Bob Stuart's Sooloos server, controlled with the new iPad app, followed by Dire Straits, the pizzicato movement from Ravel's String Quartet. and the 2L hi-rez recording of Britten's Simple Symphony, and the M6 demonstrated surprising dynamics and clarity, coupled with an overall ease to its presentation. Yes, the lows were a bit too rich, but this is a fit'n'forget speaker system that non-audiophile music lovers will go ga-ga over. 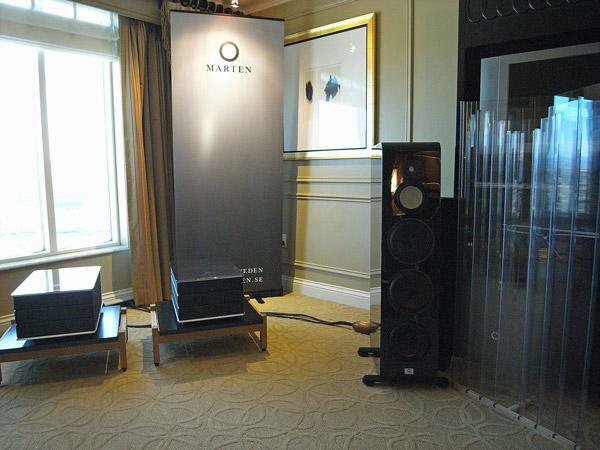 The Mårten Django represented a new direction for the Swedish speaker manufacturer, in that at $15,000/pair, it is considerably more affordable than the Mårten Coltrane speakers shown at earlier Shows. It still uses a ceramic tweeter and a ceramic-cone midrange unit, with three aluminum-cone 8" woofers, but in a less complex enclosure than the more expensive speakers. Downward-firing posts reflex-load the woofers. Set up across the room's diagonal, and flanked by Swedish SMT acoustic panels, the Jacques Loussier Trio performing an arrangement of an Eric Satie Gymnopedie was reproduced with superb low-frequency weight and definition. Amplification was Mårten's own M-Amp, with an MSB digital source. The Djangos were also being used in US importer Dan Meinwald's room, where they were being driven by EAR tube amps and a prototype EAR SACD player to great effect. 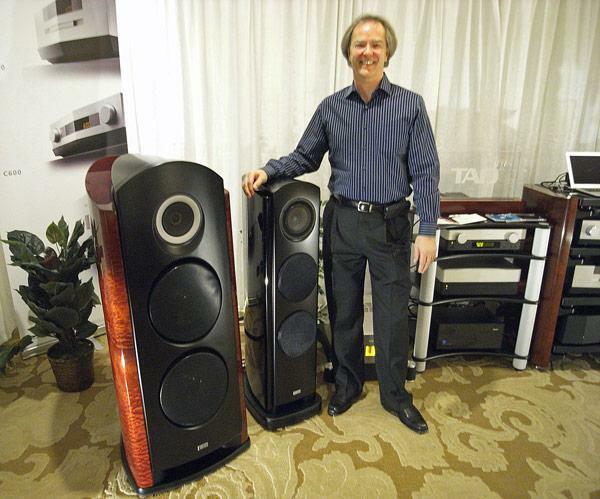 Sonus Faber co-founder Franco Serblin has started a new, eponymous company and two of his speakers, the floorstanding Ktema ($39,995/pair) and bookshelf Accordo ($12,995/pair) were being demonstrated in one of the Axiss Audio rooms in the Venetian. Amplification was all-Air TightATM-3011 monoblocks, ATC-2 preamplifier, ATE-2 phono preamplifier, ATH-2A transformerwith the source a Transrotor Fat Bob S turntable fitted with an Audiocraft AC-3300 tonearm and an Air Tight PC-1 Supreme cartridge. The laidback sound of Norah Jones matched the superb looks of the speakers and the bass was full and warmwhich impressed me the more when I realized I was listening to the stand-mounted Accordos, not the larger Ktemas. 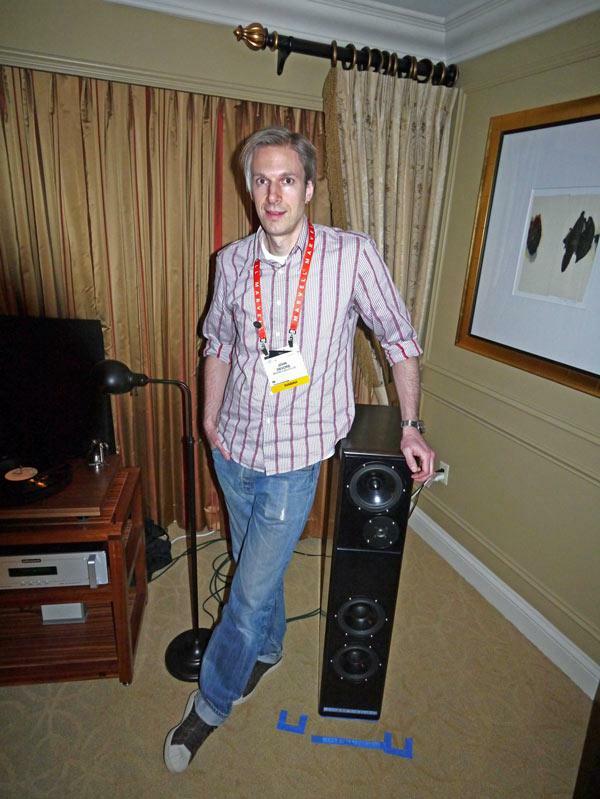 At the 2011 CES, Swedish company Perfect8 concentrated on their Force flagship speaker. 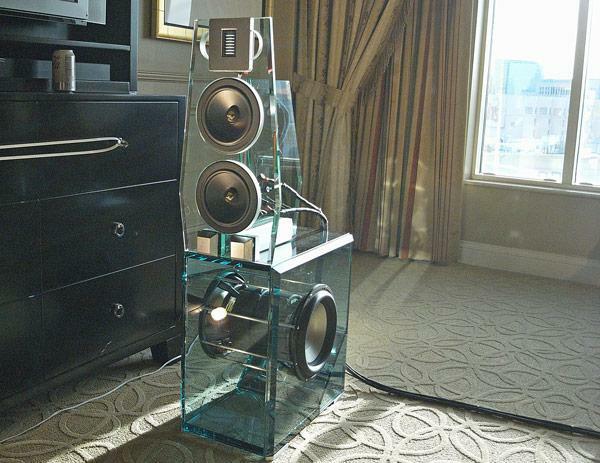 For the 2012 Show, they brought their Point Mk.II ($115,000/pair with subwoofer modules), which, like its big sister, uses an enclosure fabricated from glass—or rather, from what Perfect8 calls "Super Silent Glass," joined without solvent-based adhesives. The upper-frequency module is a dipole, allowed to roll off naturally to integrate with the subwoofer module below it, which uses two 10" drive-units mounted on its sides to cancel mechanical reaction forces. The woofer's low-pass filter is set at 86Hz and realized in DSP; the module includes a class-D amplifier housed in the triangular section at the rear. Despite my reservations about glass as an enclosure material, both Diana Krall and Rimsky-Korsakov sounded uncolored and natural. When I gave my Richard Heyser Memorial Lecture at last October's AES Convention, THX's Laurie Fincham was sitting in the audience. Afterwards, Laurie whetted my appetite for what the company would be presenting at CES: a patented non-switching power amplifier topology that would be as efficient as a class-D amplifier but without the side-effects that afflict such designs, high levels of radiated RF, for example. 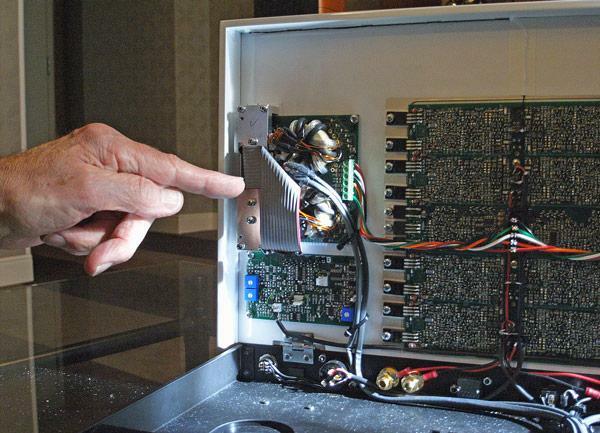 In the photo, Laurie is pointing to the power supply of the amplifier. DC is fed to two oscillators running at 25kHz, one generating a sinewave, the other a cosinewave, ie 90° out of phase with the sinewave. Each wave feeds a transconductance amplifier in the primary of a small transformer; the output of each secondary is rectified and summed to produce a high DC voltage which is then used to power the amplifier circuit. There are no storage capacitors in the circuitit looks as if almost all the energy entering the supply is available as the final DC voltage! The new topology was developed by Fincham, Owen Jones (the twin brother of TAD's Andrew Jones) and Andrew Mason. 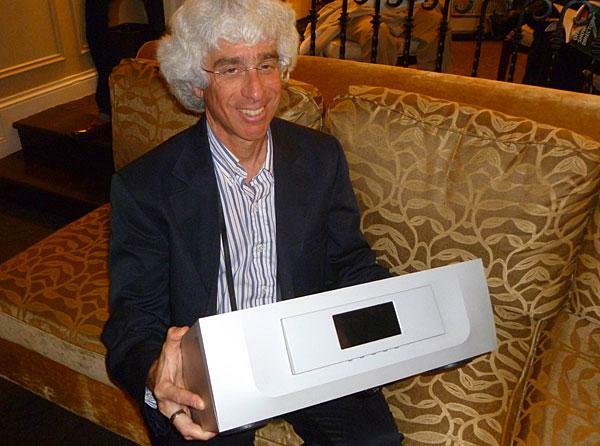 Constellation brought their new Jetsons inspired Cygnus DAC to CES, shown here in the hands of VP of Engineering Peter Madnick. 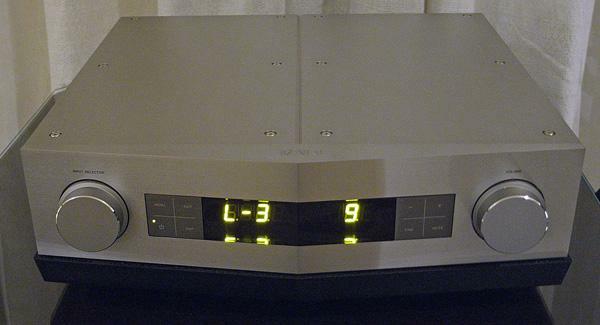 The DAC contains four 32/192 DACs in a stereo balanced configuration, with separate DACs used for the positive- and negative-going signals of the left and right channels. 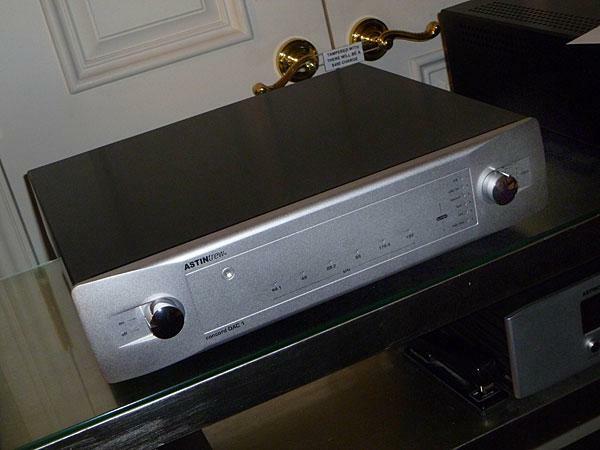 Inputs include USB, SPDIF, AES and Toslink and it looks like they've dropped the CD transport that was included in the demo at last year's CES. Price should be around $20k. 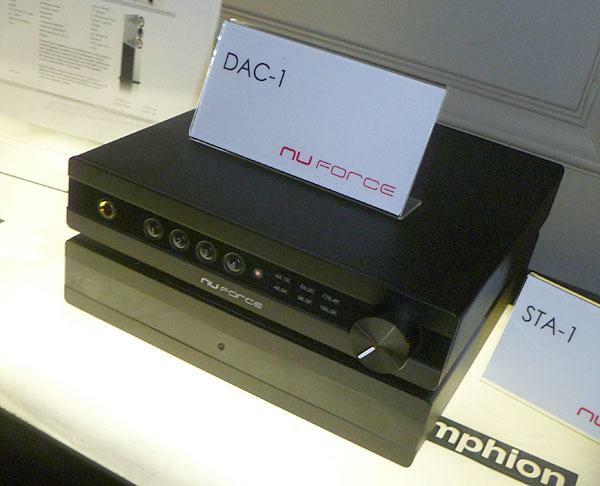 Though labelled DAC-1, this new unit is also a digital preamp featuring 24/192 SPDIF, Toslink and USB. Priced at $995 and available sometime in March or April, it also includes a remote. Based on the popular Oppo 93, Primare was displaying their universal player that will retail for $5495. 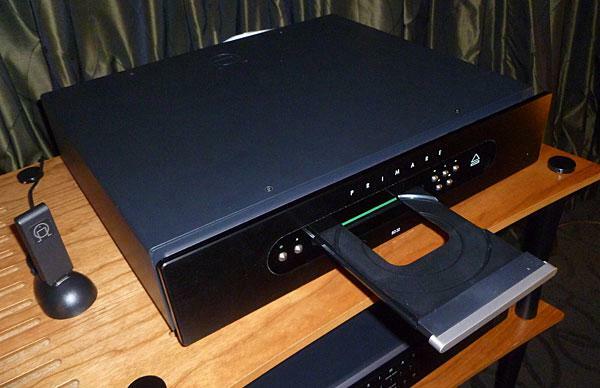 It plays all the typical Oppo disc formats including 3D Blu-ray and has custom audio, video and power supply circuitry. The BD32 is a gorgeous-looking product and the photo does not do it justice.